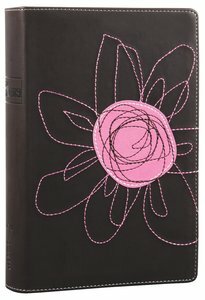 About "NIV True Images Bible Teen Girls Pink Flower Duo-Tone"
In-text features include: In Focus - stories about real issues affecting teen girls like family, friends, work, sports, guys, and more; Love Notes From God - encouraging verses and promises; Truth or Dare - practical applications for everyday life; plus edgy graphics and cool quizzes. Ages 13-16. 23 x 15.5 x 2.8 cm. NIV True Images, the only NIV Bible designed specifically for teen girls ages 13 -- 16, is for real teenage girls with real lives. Packed with edgy graphics, personal notes, cool quizzes, challenging insights, and open discussion about the realities of life, this Bible is designed to help you build a closer relationship with God. NIV True Images is as sincere about your walk with God as you are, helping you discover his will for all areas of your life, including relating to your family, dealing with friends, work, sports, guys and so much more. Whether you are reading the reality-based 'In Focus' stories about real teenage issues, drawing encouragement from 'Love Notes From God,' or letting 'Truth or Dare' challenge you in practical ways, what you will value most is discovering how deeply God is involved in your life: laughing when you laugh; grieving over your tears; listening when no one else seems to care; smiling because you delight him; and loving you through thick and thin.